Lingonberries—known as tyttebær in Norwegian and Danish, rauðber in Icelandic, puolukka in Finnish, and lingon in Swedish—are the Scandinavian equivalent to American wild blackberries. They grow abundantly on low-lying evergreen bushes throughout Scandinavian and northern North American forests (in New England and Canada). And while this autumn fruit is free for the taking by anyone with a basket, a harvesting fork, and the patience to pick, commercial U.S. cultivation practices make them seasonally available in specialty grocery stores. A lingonberry's bright red color makes them look yummy on the bushes, but it is not a good candidate for eating raw. In fact, this bitter fruit needs sugar to transform it into a jam or syrup that pairs well with wild game, red meat, fish, and several desserts. The red berry is both smaller and juicier than its distant cousin, the cranberry, and closer in makeup to raspberries, yet with a tart and sour taste. Lingonberries are traditionally harvested in September, long after the blueberry and bilberry season of July and August. Bursting with natural preservatives, like benzoic acid and pectin, lingonberries were invaluable to early Scandinavians. Their special properties allow them to be stored for months at room temperature by simply placing them in a jar of water without the addition of a preservative salt. This simple concoction of "pickled" berries in jars (called vattlingon) was saved and served alongside holiday dishes and winter comfort feasts. Early uses also included stirring the raw berries with a small amount of sugar to make a rårörda lingon, or a classic Swedish lingonberry jam—no cooking required. As the story goes, Ancient Mariners packed lingonberry concoctions—rich in Vitamin C—along on long journeys at sea to ward off scurvy. 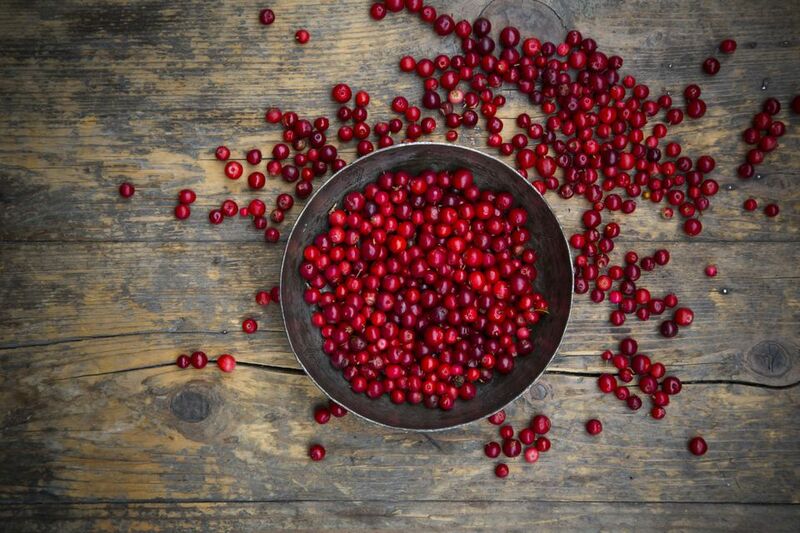 Today, this superfood is touted as a powerful antioxidant that reduces inflammation and, similarly to cranberries, wards of urinary tract infections due to its bacteria-fighting capabilities. Lingonberry and its contained procyanidins have been proven in studies to show inhibitory activity against certain types of cancers, including leukemia, colon, and cervical cancer. And Dr. Oz prizes arbutin, a phytochemical found in both lingonberry and barberry, as a remedy for age spots. In addition to Vitamin C, lingonberries contain high amounts of vitamin A and magnesium and contain as much unsaturated omega-3 fatty acids as fish per unit of energy. If you're looking for lingonberries or lingonberry jam in the United States, try a European food or ethnic market. You may also find frozen and canned lingonberries in specialty grocers or regional Whole Foods markets, sometimes sold as red whortleberries, cowberries, mountain cranberries, and mountain bilberries. It's nearly impossible to find fresh lingonberries unless you by them from an online purveyor or, of course, pick them yourself. Lingonberry sauce or jam is traditionally served alongside the ubiquitous Norwegian pancakes, Swedish köttbullar (meatballs), raggmunk (potato pancakes), and fried herring. And Christmas in Sweden comes complete with hot rice pudding, accompanied by rårörda lingon (lingonberry jam). But today, modern chefs and mixologists add them to cheesecake, soups, pickles, wines and craft cocktails. What is Tahini and How Do I Use It?